The reason why the Percol Polymers Alligator Glue, and Elastic Cement AC work better than conventional repairs is that they are 100% polymer. Current Asphalt formulations generally have a binder which holds the aggregates in suspension but allow for some movement unlike a more rigid concrete pavement which does not allow for movement at all. The binder can contain SOME Polymer but generally never more than 4% or 5% at most. Percol Polymers (i.e. Alligator Glue, Elastic Cement AC), unlike conventional asphalt, is impervious to future moisture penetration, along with Hydraulic Fluid, Brake Fluid, Diesel, Jet Fuel, Gasoline, Various Acids, or any other compound that can break down the emulsion binder and allow it to release its grip on the aggregates, avoiding subsequent pothole, birdbath or alligator formation. Asphalt Pothole Repair, Broken Asphalt Repair, Asphalt Crack Repair, Asphalt Parking Deck Repair, Asphalt Highway Repair, Asphalt Parking Lot Repair, Asphalt Driveway Repair, Asphalt Sidewalk Repair, Level Uneven Asphalt Repair, Asphalt Highway Shoulder Repair, Alligator Asphalt Repair, Asphalt Walkway Repair, Asphalt Airport Runway Repair, Asphalt Ramp Repair, Asphalt Equipment Bases, Foundation, Asphalt Loading Dock Repair, Asphalt Manhole Repair. 1201 PERCOL Elastic Cement AC is a machined dispensed polymer for asphalt reconstruction. Suitable for narrow or wide cracks, alligatoring, and pot-holes. No asphalt removal. Repairs support load, restore aggregate interlock, improve ride, and blend in visually with surrounding pavement. A thin sand-topped coat fuel-and water-proofs asphalt. 1205A PERCOL Asphalt Welder is a machine dispensed polymer polymer for restoring cracked asphalt. This low viscosity, rapid curing polymer penetrates spidered and hairline cracks. 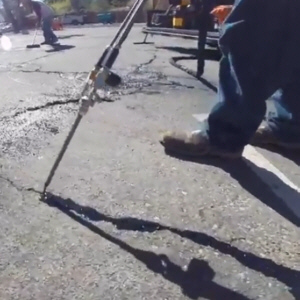 Cracks 1/8" and wider are filled with sand then saturated with Asphalt Welder to form a high strength polymer asphalt. Spalls are repaired with 1/4" to 1" aggregates depending on size and depth of spall. Use for an anti-skid and wearing surface by topping the repair (while wet and before set up of polymer or slurry) with Anti Skid. Mix your materials and apply as you would with our standard process. Use topping sand generously on the GeoFlo Asphalt Slurry, Alligator Glue, Asphalt Welder & Elastic Cement AC with Black Diamond Sand. When the material has set up, sweep off access sand and your asphalt repair is ready. We recommend that you use our specially-coated black diamond sand because it bonds better to our products than other sands. Available in 12 or 25 pound bags.